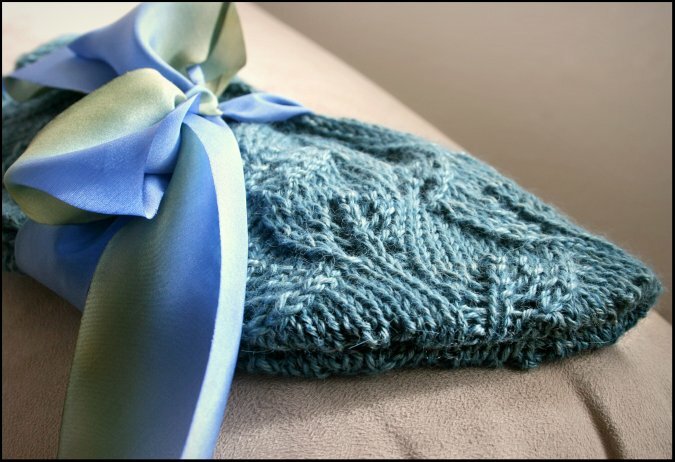 for the Never Not Knitting trunk show by Preeti of the Rambling Roses blog. The Madelinetosh Tosh Merino yarn that this pattern calls for can be hard to come by since it is in such high demand. It's a wonderful yarn and its not hard to figure out why it is so popular. Time and time again I search for this yarn in a certain colorway only to find my favorite online shops claiming that it is "back ordered" once again. If this has been your experience, no need to fret. The above sample looks surprisingly similar to the original, yes? The amazing thing is that the body of this piece is not Madelinetosh Merino but Dream in Color Classy! Yes, the Strange Harvest colorway in Classy is nearly identical to the Madtosh Olivia colorway! Don't you agree? I love this colorway so much. It might be my favorite. I'm so happy to know of an alternate. With the weather getting a bit cooler, I've been thinking of this design more and more. It's perfect for Fall. Also I have been obsessing over making a lace weight or sock weight version for myself. I was inspired after seeing THIS project on Ravelry. Recently I have been receiving back garments from my test knitters practically every day! I have been getting many of my patterns knit up for a second and third trunk show. This way the yarn shops don't have to wait so long to display the garments. I wish that I could do all of the knitting myself, but it's a huge job. It's been nice receiving help with the task. and receiving a nice neat finished garment in the mail soon thereafter. It's like instant knitting. And its great. And have I mentioned that it's also been a great way for me to use up some of my stash yarn? 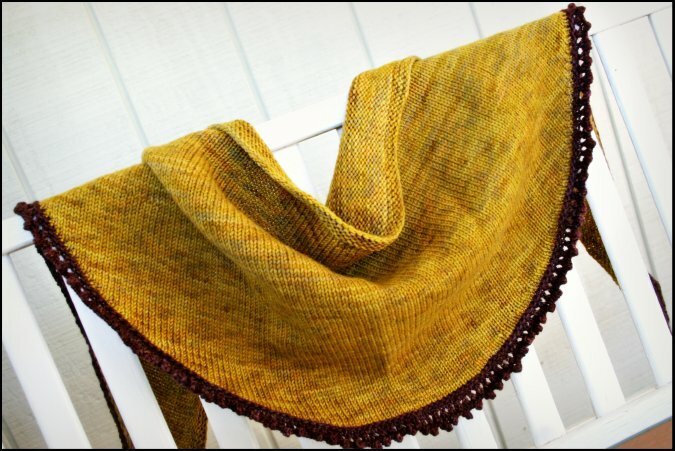 Here is another Shawl Collared Cowl knit by my friend CeRae. This cowl is knit out of Rowan Cocoon yarn. This yarn's mohair content gives the fabric a slightly fuzzy texture. 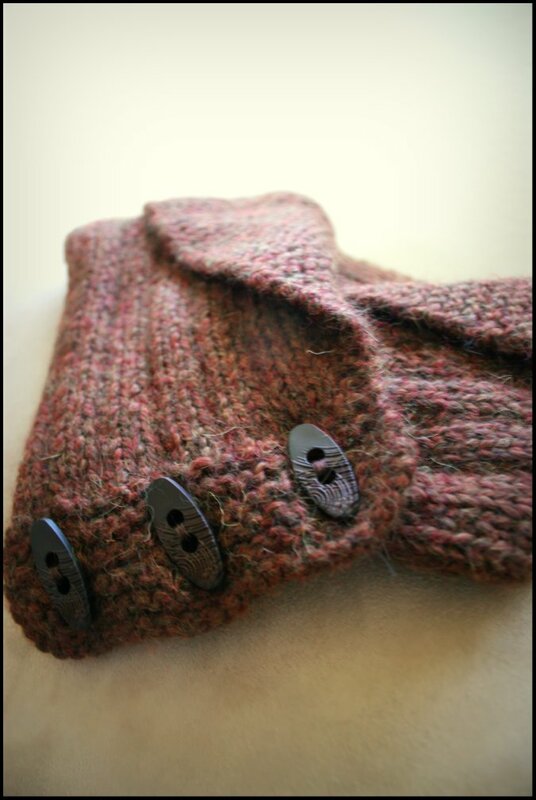 The rustic wood buttons that she chose really set off the cowl nicely. I really like the way this looks. Another yarn that would give a similar look would be Lamb's Pride Bulky. My latest pattern is now available! 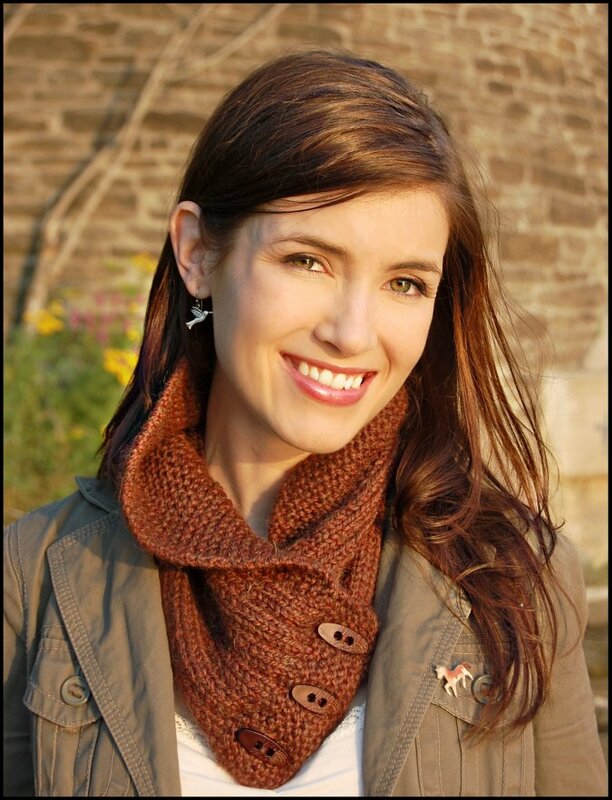 Get ready for Autumn with the Shawl Collared Cowl! A simple idea with an added twist. I think that shawl collars are so flattering and they keep your neck very warm. 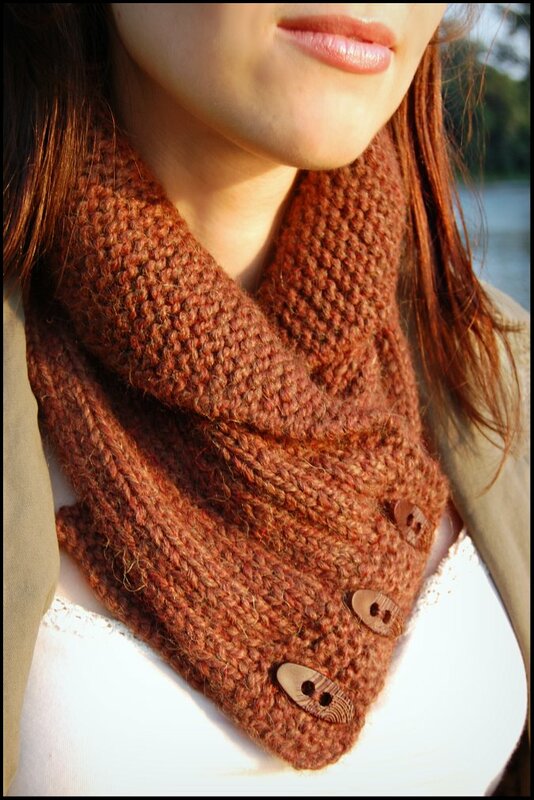 Since a cowl's sole purpose is to keep your neck warm, I think its a wonderful pairing. It's both practical and attractive. show off some special buttons that you have been saving. As you can see from the below photos, this piece can be worn a few different ways. I think it looks wonderful under a jacket. Or here is an example of the collar worn flipped out rather than folded down. This cowl is knit with bulky yarn and only takes a few evenings to finish. I think it would make a great quick-to-knit gift! Will Autumn come already so that I can wear mine? Width: measures approx 10 inches at deepest point of center including unfolded collar. Misti Alpaca Chunky [100% Baby Alpaca; 108 yd/99m per 100g skein]; color: 683; 2 skeins or approx 175 yds of a chunky weight alpaca or alpaca blend. 20 sts/32 rows = 4" in garter stitch on size 9 needles or size needed for accurate gauge. This pattern calls for the use of short rows, which seems to be a technique that I am using more and more in my patterns. I just love them. Once you get the hang of them, they are very easy. The pattern contains detailed instructions for how to execute this technique. 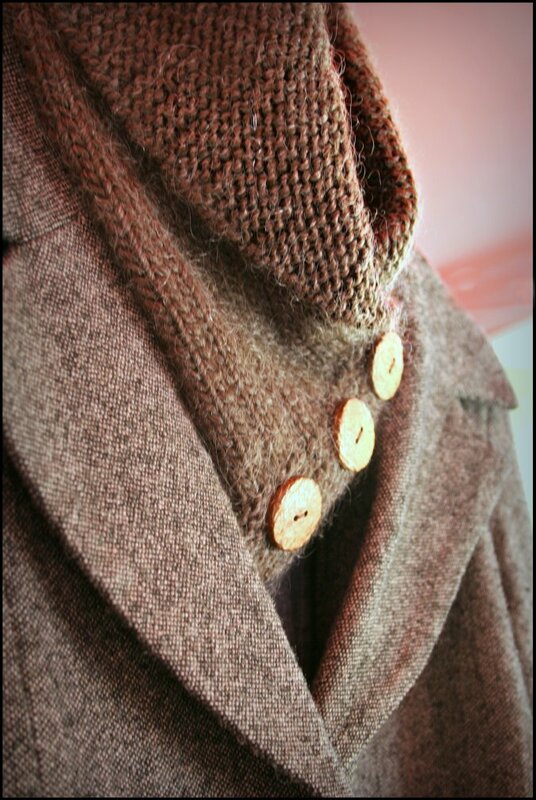 One great thing is that the short rows all fall in the garter stitch section of the collar. So there is no need to pick up and knit your wraps later. That saves a lot of time. This pattern was knit out of Misti Alpaca Chunky which if you haven't used before, is wonderful wonderful stuff! Its super soft and cushy and WARM. This color that is pictured is called Cimarron. I didn't plan this, but doesn't this color perfectly match the models eyes and hair? Wow, didn't that coordinate well! 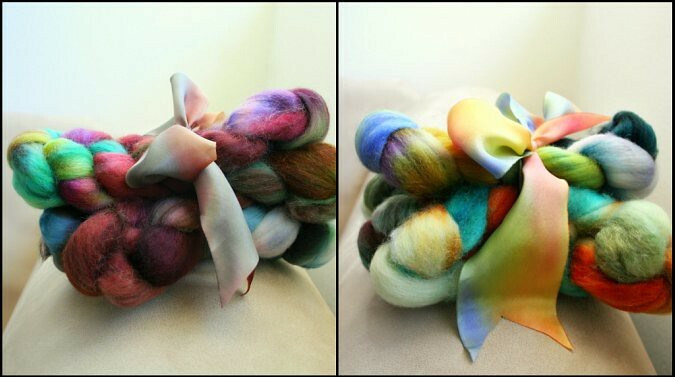 Misti Alpaca also comes in a variety of lovely handpainted colors as well. I think that the color Pride Rock (found here) is especially gorgeous for autumn! I think that the cowl would look equally beautiful in a multicolored yarn because the stitches are simple so it wouldn't be too overwhelming. Thank you again to Julie Crawford from www.knittedbliss.com for doing such an awesome job on modeling this cowl for me! This pattern is now available in French. Click here for the French translation. Here's a little glimpse at a new pattern I have coming out shortly. 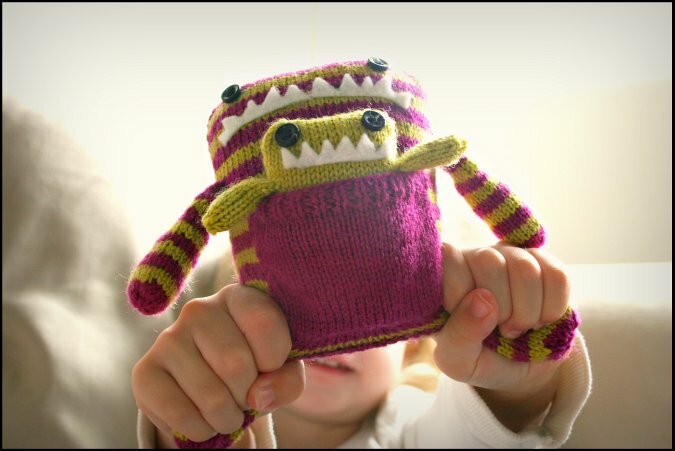 Its a quick to knit small item that is soft, squishy and very warm! 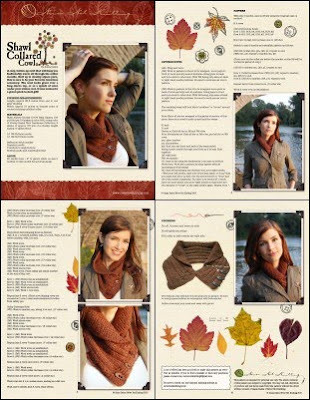 This is going to be a great item to knit and wear for autumn. I cant wait until it gets cold enough out to wear mine! A few days ago I stayed in all day with a cold. Who gets sick in the middle of summer anyways? Although I was miserable, it allowed me the opportunity to finish up two of my knitting projects. And that means that I now have some new photos to share! 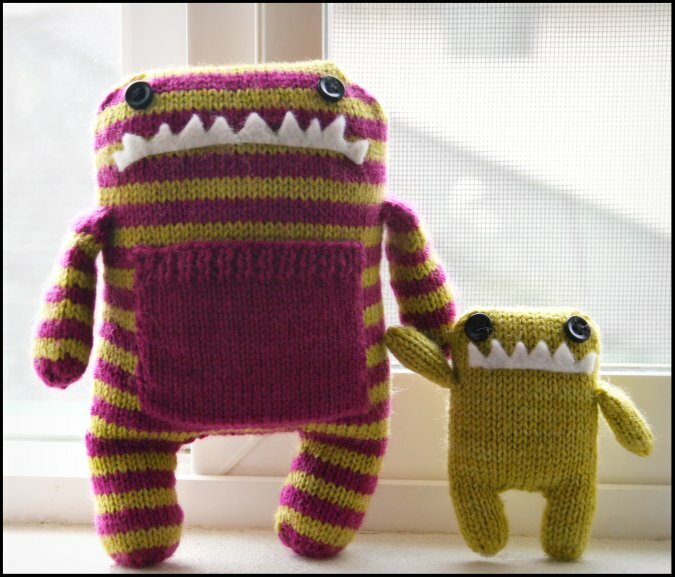 The knitted monsters! They are done! Aren't they cute? My daughter is pretty happy with me for finally sewing these up for her. I love that there is both a Mama and baby. So sweet. 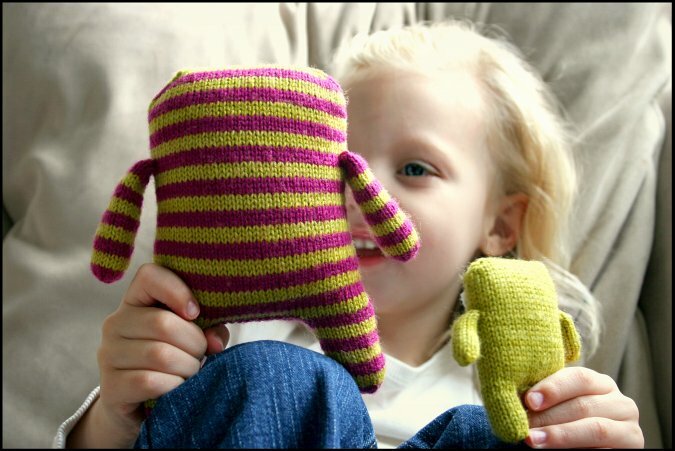 The pattern is called "Daphne and Delilah" and can be found HERE. My daughter has declared these as "her new best knitted toy." Cant beat that. I just love making toys. Especially ones with attitude. 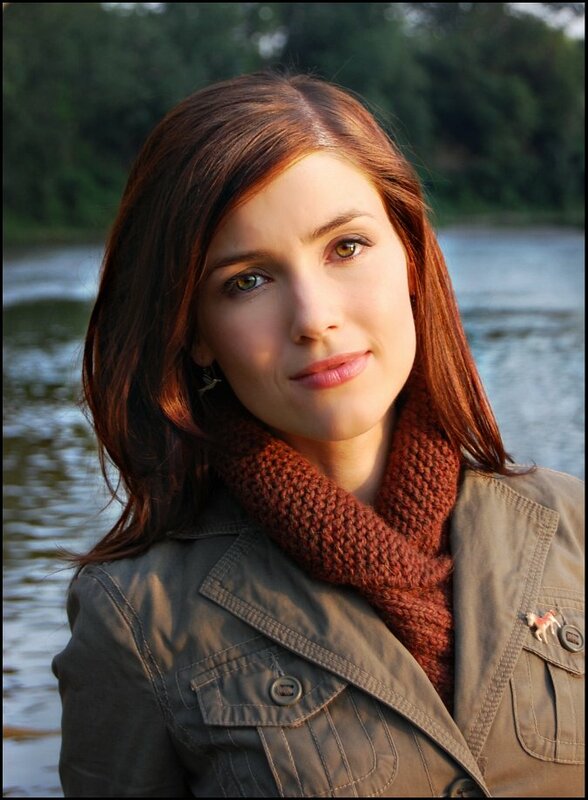 The Winner of Episode 39's Fiber Company drawing giveaway is Chantal B! Congratulations! The Funky Carolina promotion has been changed as of 8/5/10. To minimize confusion, both US and international customers will receive 10% off their order through the month of August. To receive your discount, just enter special code "NNK" in the comments section when you place your order. The discounted amount will then be refunded back to you. Also be sure to listen to the podcast to find out about the "exclusive" Funky Carolina shopping opportunity! These offers are exclusive to the Never Not Knitting listeners and blog readers! Have fun! Click HERE to download Episode 40 MP3 file.